Seychelles President James Michel attended the opening ceremony of the World Future Energy Summit 2016, as part of Abu Dhabi Sustainability Week, at Abu Dhabi National Exhibition Centre (ADNEC) today. Prior to the ceremony, President Michel met with HH Sheikh Mohamed bin Zayed Al Nahyan Crown Prince of Abu Dhabi Deputy Supreme Commander of the UAE Armed Forces and HH Sheikh Mohamed bin Rashid Al Maktoum, Vice-President, Prime Minister of the UAE and Ruler of Dubai as well as other world leaders present for the event. The Chairman of Masdar and UAE Minister of State, H.E. Dr Sultan Ahmed Al Jaber opened the prestigious event which brings together more than 30,000 people, all working towards ideas and technologies for a more sustainable future. Keynote addresses were presented by the United Nations Secretary General H.E. Ban Ki-Moon and the President of Mexico, H.E. Enrique Peña Nieto. 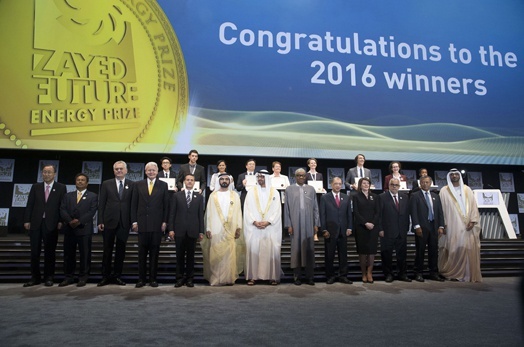 The opening ceremony was followed by the Zayed Future Energy Prize award ceremony, where young innovators were rewarded for providing solutions and technologies that make human life and energy use more sustainable. A Lifetime Achievement award was presented to the former Prime Minister of Norway, Dr. Gro Harlem Brudtland. Also present during the event were HH Sheikh Hamed bin Zayed Al Nahyan, Chairman of Crown Prince Court - Abu Dhabi and Managing Director of the Abu Dhabi Investment Authority (ADIA), HE Henry Puna Prime Minister of the Cook Islands, HH Sheikh Suroor bin Mohamed Al Nahyan, HH Sheikh Nahyan Bin Zayed Al Nahyan, Chairman of the Board of Trustees of Zayed bin Sultan Al Nahyan Charitable and Humanitarian Foundation, HE Tommy Remengesau President of Palau, HH Sheikh Hazza bin Zayed Al Nahyan, UAE National Security Advisor and Vice Chairman of the Abu Dhabi Executive Council, HE Tomislav Nikolic President of Serbia, HH Sheikh Hamdan bin Mohamed Al Maktoum, Crown Prince of Dubai, HE Olafur Ragnar Grimsson President of Iceland, HE Enrique Pena Nieto President of Mexico, HH Sheikh Saif bin Mohamed Al Nahyan, HE Muhammadu Buhari President of Nigeria and other dignitaries. On Tuesday, President Michel will address the Second Blue Economy Summit, which is co-hosted by the governments of Seychelles and Abu Dhabi during Abu Dhabi Sustainability Week.